With the baguette gone, it was back to toasted sandwiches. Today we used the other chicken breast, an avocado and kumato with the garlic spread and it was really good! The avocado was 44c per serve. A really tasty sandwich for $2.14 per serve. 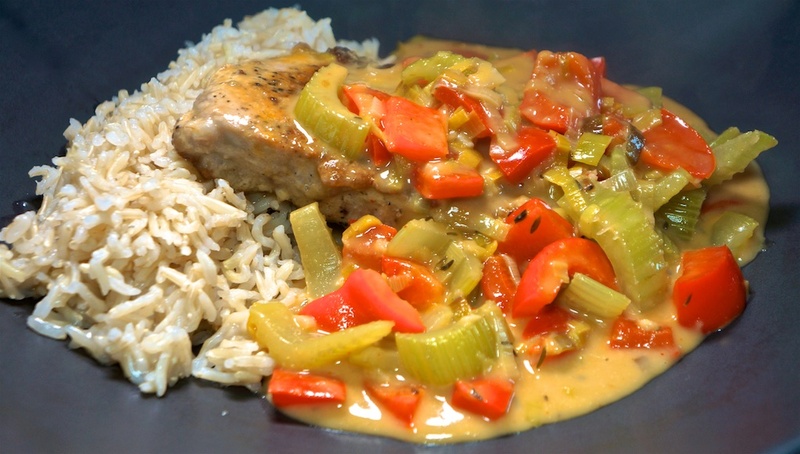 We’re always looking for new ways to cook the meat we get from (now) Keller Crafted meats and tonight we though our thin cut pork chops would be good smothered with brown rice. The sauce makes four serves, so there was leftover. Add 20c for other ingredients. We felt the sauce was a little lacking in depth, despite the hot sauce, but was tasty enough. We cooked our thin cut pork chops way less than recommended for the thick cut of the recipe, so they were not overcooked. A good meal for $7.24 per serve. Today were were able to get to Jon’s and pick up a BBQ chicken and baguette. Instead of mayonnaise we used the garlic spread we’ve been enamored of lately. We also substituted the moon touched (semi-dried) tomatoes for more intense flavor. Add 30c for garlic spread. The garlic spread really elevates this simple roll, for $2.23 per serve. 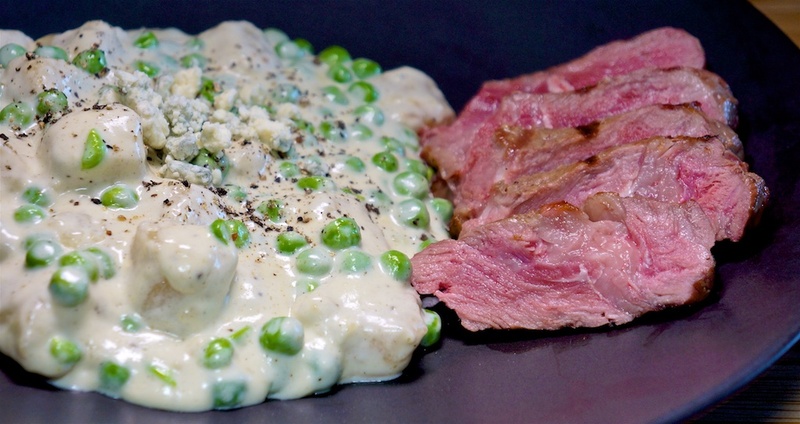 Thursday night is traditionally our ‘steak night’ and tonight we followed tradition with NY Strip Steak, paired with a creamy blue cheese gnocchi. The gnocchi was made from cauliflower, but you’d never know. Brown rice adds 33c per serve. You would never know you were eating cauliflower, as the gnocchi and sauce were very tasty and balanced well with the steak. An expensive meal at $13.08 per serve, but mostly because of the excellent, dry aged beef we get from Prather Ranch (rebranding to Keller Crafted Meats). Even thought the weather is warming, we still prefer our lunch sandwiches toasted. This worked well today as toasting the sandwich softened the feta. This was a really good combination. The garlic spread is $2.99 for the container and we used about 1/10 or 15c per serve. We’re finding the Trader Joe’s Garlic Spread/Dip to be a great substitute for mayonnaise on our lunch sandwiches. Today’s was particularly good for $2.26 per serve. Tonight was LACPUG night, so dinner is pizza afterward where we now contribute $10 per person. The Foodies were at an on-site software demonstration and the host invited us to lunch, so we ended up having some rather good sushi. 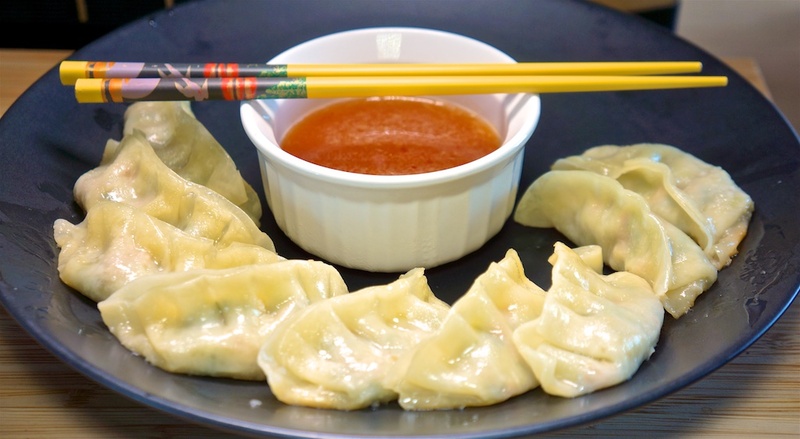 We decided on a very simple meal of the Thai Vegetable Gyoza from Trader Joe’s done potsticker style. We served with a dip created from sweet chili sauce, lime juice and fish sauce. Add 30c for dip ingredients. Dinner tonight was actually pretty good for $2.30 per serve. Another direct repeat of the tomato and garlic spread, but today we added more garlic spread, and some shaved ham. Two tasty sandwiches for 98c per serve. As a variation on Gordon Biersch for our monthly developer get together we decided on the new Yard House in Burbank after our positive experience in Las Vegas. Foodie Philip once again ordered the Spicy Jambalaya he’d enjoyed during NAB week, and Foodie Greg had a Cuban Pork Dip. The meals cost an average of $21.65 with tax and tip. We had to repeat yesterday’s tomato and garlic spread, but today we added more garlic spread, and some shaved ham. 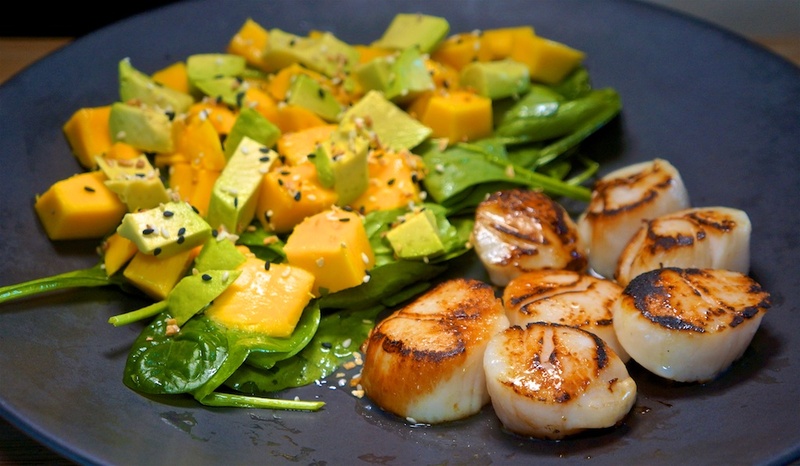 A return to a favorite meal: Seared Sea Scallops with an Avocado Mango salad. Foodie Greg prepared the scallops by defrosting then salting and drying between two sheets of paper toweling to reduce moisture on the scallops, which helps the sear. We had a different mango – a honey mango – that we preferred because this variety, while small, is less sweet than the more common Haden (from Mexico) that we get around here. The scallops were seared and translucent and the honey mangos in the salad elevated it. All in all a good meal for $9.43 per serve. We have discovered Trader Joe’s Garlic Spread/Dip and it goes very well with tomatoes in a toasted sandwich. Very well. Two tasty sandwiches for 82c per serve. 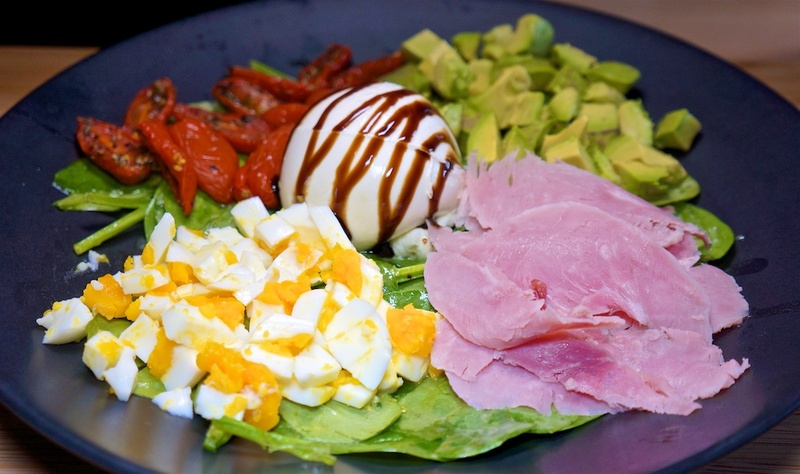 Tonight we created another Cobb Salad variation using ham and moon kissed (semi-dried) tomatoes, along with avocado, egg and burrata on a bed of dress spinach. The bake ham is 63c per serve and we had 1/2 serve each, or 32c per serve. Tonight’s Cobb Salad was a good variation for $4.98 per serve. It’s been a while since we had the pita pockets from Skewers Halal, who’s servings are huge for $9.80 per serve, including tax., The chicken and beef were as good as they always have been. After such a large lunch we opted for something simpler and smaller for dinner, settling on tostadas smeared with avocado, onto which were piled Cuban style black beans, topped with a fried egg and garnished with salsa and cotija. Add 40c for salsa and a dusting of cotija cheese. Dinner was very tasty and a lot more filling than you’d think. A good meal for $2.41 per serve. We repeated the ham and avocado sandwich from yesterday, but added thinly sliced shallot and toasted the sandwich. It was a big improvement on yesterdays’. The bake ham is 63c per serve and we had ⅛ serve each, or 8c per serve. Add 25c for mustard aioli and shallot. Today’s sandwich was a big improvement on yesterday’s. The shallot provided a little crunch for textual variation and created an almost Asian flavor overtone that was quite interesting for 95c per serve. 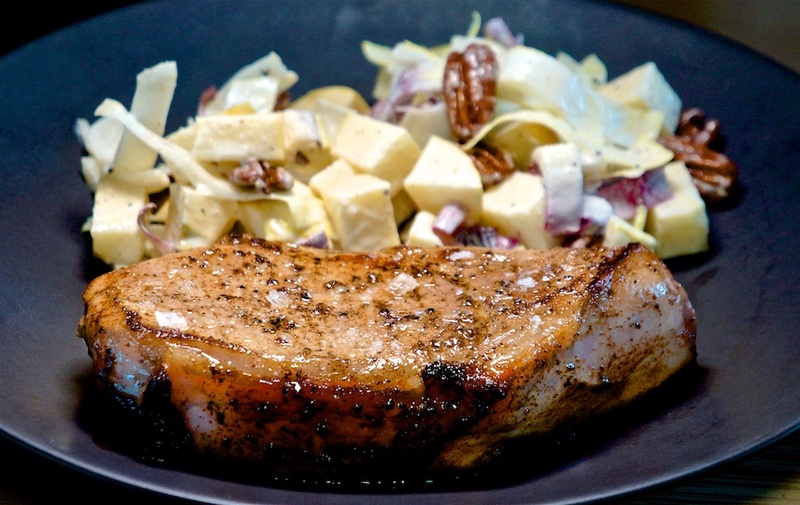 A favorite, and huge meat blowout, are the bone in pork chops from Prather Ranch. Like all Prather Ranch meat these are dry aged and very tender when sous vide to the perfect temperature and then fried off in butter! The Apple and Endive salad was a perfect accompaniment providing crisp tartness and a little bitterness. Add 50c for dressing ingredients. While expensive at $12.68, this was an excellent meal that would have been 4-5 times more expensive at a restaurant. For the first time in months we didn’t toast our sandwich! Today’s ham, avocado and mustard sandwiches were enjoyed outside. Add 20c for mustard aioli. Today’s sandwich needed a little crunch but was otherwise okay for 90c per serve. 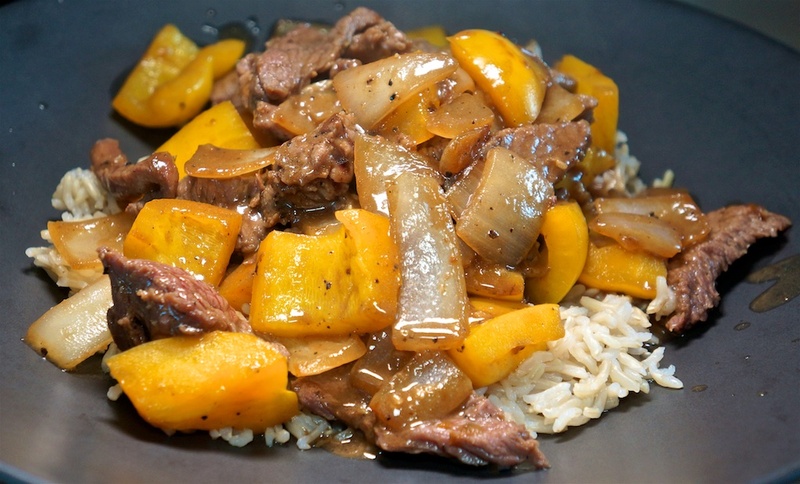 For dinner we returned to a favorite: black pepper beef with brown rice. Add 33c for brown rice.